I got a tweet earlier today from my Twitter friend Badabing Doc informing me that actor James Gandolfini, aka Tony Soprano, had passed away suddenly. That’s very sad news indeed. He was a very talented man. Badabing posted a tribute to the late actor on his blog, Badabing’s Badaboom. If you were a fan of the HBO series, The Sopranos, you may want to check out his blog post here. I’m sure you’ll recognize some of the Italian/American expressions that you heard on that show. I’m writing this post as my own tribute to Gandolfini and his Tony Soprano character. To me, that show was the best I’ve ever seen in my life, and it actually gave me the idea to incorporate mafia characters into my novel Just By Chance. As a tribute to him and his character I’m posting the opening chapter. If you enjoyed it, let me know at jd@jdcannon.com. J.D. Vincent Molini pushed open the glass doors of the Catch-22 and entered the popular Boca Raton nightspot. It was halfway through happy hour and the place was packed. The shiver that flashed down his spine told him he was taking a risk…a big risk. But, it was too late to back out now. Molini’s eyes swept over the patrons bellied up to the bar. He found the man he was looking for standing at the far end with his back to the wall glancing at the bar’s entrance between sips of single malt scotch. Dominick “Fats” Gallo, all two hundred and eighty pounds of him, was dressed in a white short-sleeved shirt and white slacks. Three chunky gold rings on each hand and a couple of heavy gold chains around his neck completed the wardrobe. They made eye contact, and Molini headed in Gallo’s direction, holding the briefcase tightly at his side. As he walked through the twenty-to-fifty-something crowd, Molini looked around to see who might have accompanied Gallo. Molini knew that Gallo never traveled alone, particularly when money was involved. He spotted two bodyguards sitting at a table just behind the rotund mobster. “How you doin?” Molini said, nodding. “Whatever you’re having,” Molini said, putting the briefcase between the brass foot rail and the bar. “We’ll see,” Molini said. “Nobody can know about this.” He stared at Gallo. “Hey, I know how Frank feels about certain investments,” Gallo said, smiling. Gallo was referring to Molini’s boss, Frank Famulari, who preferred that his money be invested within his own New York family, and who was adamant that his people stay away from the drug trade. Molini was nervous, but he had already committed. Gallo was expanding his cocaine operation and was offering to double Molini’s investment in a matter of weeks. But, if Gallo crossed him, Molini would have a hard time explaining how he lost the money. “A’ salut, to our health,” Gallo said, clinking Molini’s glass. 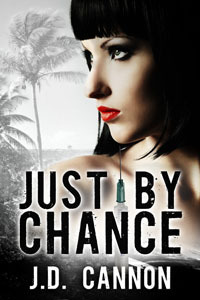 You can find out more about Just By Chance here. This entry was posted in Uncategorized and tagged James Gandolfini, mafia novels, murder mystery books, mystery novel, suspense novel, The Sopranos, Tony Soprano, women sleuths. Bookmark the permalink.